Noonlight has certified agents in the U.S. standing by 24/7 ready to send help in the event that your smart home triggers an alarm. Noonlight can respond to security, smoke/fire, and medical emergencies in all 50 U.S. states. Using the Noonlight SmartApp for SmartThings, you can configure Noonlight to receive alerts from Smart Home Monitor or via any other Routine, Scene, automation or SmartApp you can imagine. Log in to the SmartThings IDE and go to My SmartApps. Click on the Settings button in the upper right of the page. The GitHub Repository Integration modal should appear. If you don't have a Settings button, you need to Enable Github Integration first. 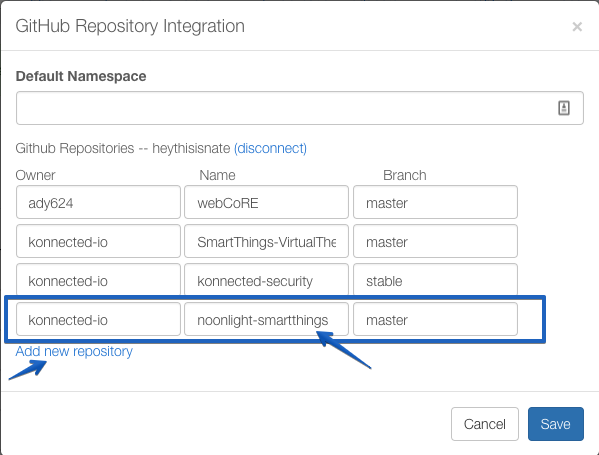 Click Add a new repository and enter Owner: konnected-io; Name: noonlight-smartthings; Branch: master. Then click Save. Click on the Update from Repo button and select noonlight-smartthings from the drop-down. In the Update from Repo modal dialog, select the noonlight.groovy app in the New column, click the Publish checkbox, then click Execute Update. Next, click the Edit icon next to the Noonlight SmartApp that was just added. Scroll down to the OAuth section in the SmartApp settings and click the button Enable OAuth in SmartApp. Next, go to My Device Handlers and do the same procedure: Click Update from Repo, select noonlight-smartthings, then check and publish the noonlight-alarm.groovy device handler.